"Torment" - Part 2: "Crack-Up"
Krypton erupting from the streets of Metropolis turns out to be a terrible nightmare. Clark wakes up with a start and overhears Lois making an interview date with Pete Ross. In Gotham City the Batman and Commissioner Gordon watch Killer Croc from a security feed inside the man-monster's cell. They discuss whether or not Croc had been working alone and Batman insists that his old enemy was definitely working with someone. At the Daily Planet in Metropolis Clark finds it increasingly hard to concentrate. Thoughts of his nightmare consume him to the point he runs out of the newsroom. Elsewhere the old man, who is in reality Desaad, follows a woman on to the subway and tortures her before leaving her in a heap on the floor. 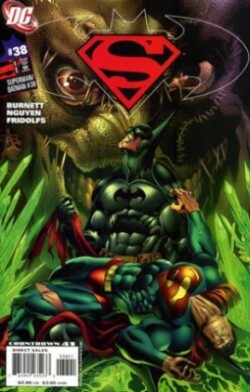 He joins a man named John inside a make-shift laboratory where John has been busy using the tech they had stolen from Lex Luthor to give Superman his recent nightmares. Clark finally finds the one woman he believe can help him; Lois. Lois is having lunch with Pete and Clark interrupts it before thinking that everything he is doing is wrong and runs back out into the city. His actions cause a truck hauling flammable materials to crash and despite his condition Clark manages to grab the tanker and fly it high into the atmosphere where it explodes, knocking him back to Earth. Meanwhile Batman "interrogates" Lex Luthor who reveals that the item stolen from him was simply an inter-dimensional transmitter that can receive and transmit signals anywhere in space/time. Batman leaves him after getting the information he wanted with Lex threatening that Batman had better watch himself. A world away Desaad returns and is informed that he has been summoned several times since leaving. Darkseid calls out to him and Desaad briefs him on what has been happening on Earth. Darkseid tells him to be quiet before stumbling down a stone flight of stairs. Recovering, Darkseid asks when Desaad's task will be done. Desaad informs his dark lord that it will be an hour, maybe two and certainly before night has ended in Metropolis. From a distance a scantily clad woman watches and takes satisfaction in Darkseid's fall. 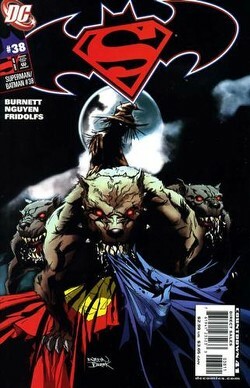 In Metropolis the Scarecrow uses deadly dogs to track down Superman. They find him in a junk yard where the Man of Steel is hiding. Story - 4: Not bad. Not the best Superman/Batman story I have ever read but it is far from the worst. This is actually an odd assemblage of characters. I would have never thought to put the Scarecrow and Desaad together but in a strange way it makes perfect sense. Crane gets his kick by instilling fear. Desaad... well, Desaad gets his name from the Marquis De Sade, so it's not a tremendous leap to say the guy gets off on torture. So pulling a Batman villain fairly entrenched in Batman's world of Gotham into the Fourth World is an interesting juxtaposition. This issue had some fairly strong moments as well. The scene on the train, while a tad on the unnecessary side, was a good use of Desaad as the sick, demented torturer. The randomness of the scene heightened the sense that Desaad picked this woman out casually. It almost felt like Desaad was using this woman the way a person may use a crossword puzzle on the subway; a momentary distraction on the way to work. Creepy, but in a good way. I felt a little let down that the whole Metropolis changing into Krypton thing turned out to be a dream sequence. I'm not one for cliffhanger endings turning out to be a red herring. I almost feel cheated in a way. Despite that feeling I liked how Burnett played with a Clark whose world has gone insane. It built nicely from Clark waking up to his break down at the Planet to his total wig out on Lois and Pete. This could have gone down badly, but it didn't. My only real problem with this story so far was the confrontation between Lex and Batman. I think the concept of Batman going after Lex has been played out recently, but this has more to do with my overall problems with certain creators trying to have Lex be a Batman villain. Batman has enough villains. Leave Lex to Superman. Yeah it's kind of silly, but that's how I roll sometimes. Art - 3: The art didn't bug me as much as last issue and there were places, like Clark's various meltdowns, where I enjoyed it, but on the whole I am still not feeling Nguyen and Fridolfs work on this title. It's growing on me and by the end of the arc I may even like it, but for right now I am lukewarm on the artists' work. Cover Art (Nguyen and Fridolfs) - 4: Despite not liking the interior work I was all about this cover. The Scarecrow looks appropriately spooky and I like the fact that even though Superman and Batman aren't in the cover that they are still represented by their costumes. I'm a little put off that this kind of ruined the surprise of who one of the villains was, but I think I can deal with it this time. Cover Art (Claudio Castellini with Paul Mounts) - 3: Funky. Not good. Not bad. Not even to my liking, but funky. This is a very strange cover and I'm not sure how to feel about it. While it was much better than Castellini's cover from last month I still have to go with Nguyen and Fridolfs for my pick this month.